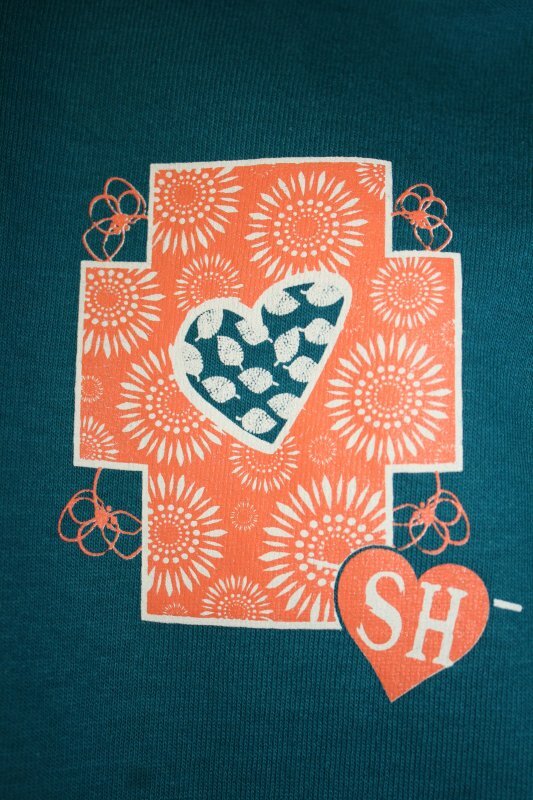 This shirt features a coral/peach thick cross with white flowers inside. The cross has a purple lined heart out of the center. The inside of the heart has small leaves made with dots. There are line drawn flowers coming out of the edges of the cross in the corners. Around the perimeter of the thick cross written in white in the verse from Ecclesiastes, "He has made everything beautiful in its time. He has set eternity in the human heart; yet no one can fathom what God has done from beginning to end. Ecclesiastes 3:11"
The front of the shirt features a smaller version of the back cross in just the coral/peach and white colors. The small heart logo of Swinging Hearts in the bottom of each cross. Wear these shirts with pride while spreading God's word for all to see.